It was a weekend of highs and lows for the University of Manitoba Bison soccer team, who drew even in back to back matchups against our prairie neighbours: the University of Regina and the University of Saskatchewan. Friday night saw the Bisons overcome a wild rainstorm and rough play to pull out an exciting 2-1 victory over the University of Regina. The torrential downpour delayed the game but didn’t deter fans from coming out in high numbers to create an electric atmosphere. Rookie sensation Bruna Mavignier continued to impress, getting the Bisons on the board first just under eight minutes into the game. The goal came after a near 40-minute rain delay had sent both teams sprinting for cover. The second half featured a few quality chances for both teams, with Manitoba capitalizing just under 54 minutes in. Megan Graca set up captain Sarah Haiko for the game-winning goal off a corner kick. Regina finally solved Bison goalie Martina Arran at the 83-minute mark on a header from Adriana McCullough, but it was too little too late, as the Bisons emerged victorious. Manitoba didn’t fare as well on Saturday, losing 3-1against a much bigger University of Saskatchewan squad. Head coach Vanessa Martinez-Lagunas lauded the skill of Saskatchewan, but felt her team could have matched up better. Jenelle Zapski made the difference for Saskatchewan. She helped build up a 3-0 lead for the Huskies, scoring all three goals. They came at 26:50, 44:02, and 49:15 – all inside the penalty area. With the hat-trick, Zapski now has four goals in two conference games. 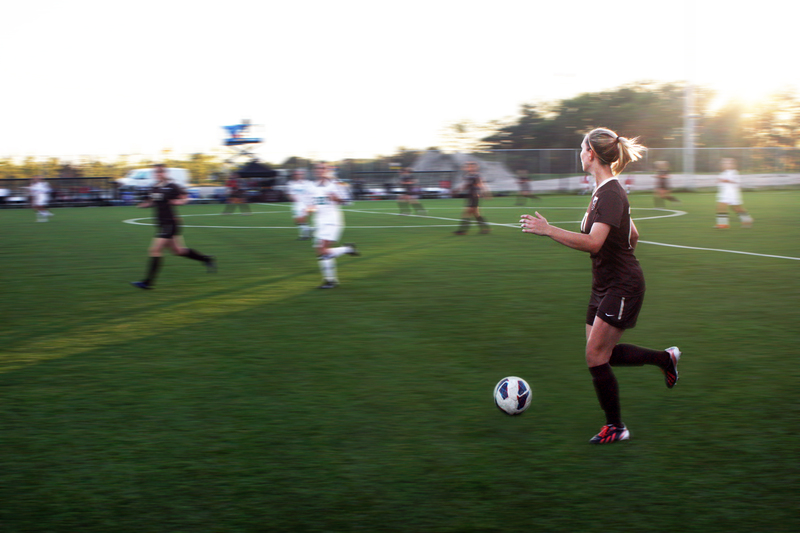 Manitoba managed to get on the board in the 64th minute, as Mavignier tallied her second goal in as many games. The Bison tally ignited the team. They continued to pressure Huskies goalie Kyleigh Vause, but could not find the back of the net. Martinez-Lagunas felt the Bisons’ play Friday and Saturday was influenced by the difference in competition between opponents. “[The] opponent makes a huge difference,” she said. Bison rookies Camille Plett and Jamila Calvez, alongside Mavignier, were standouts for the Bisons yet again. Plett connected with Mavignier and Calvez continued to use her speed to cause problems for opponents. “First of all, they bring a lot of freshness and creativity. They are rookies and they have been playing very well,” Martinez-Lagunas said, commenting on the play of her rookie forwards. The next Bison soccer action is on Sept. 13, when they take on city rivals the University of Winnipeg in the Duckworth Challenge.